We've just made a start with the Hooper Gallery by providing you with a nice set of wallpapers of a 1933 Hooper & Co. Rolls-Royce Phantom II Continental Sports Coupe. Hooper & Co. specialized in the very top end of the market, building the most luxurious bodies possible for Rolls-Royce, Bentley, Daimler, Minerva and such. Their cars were generally not very sporty, but they specialized in stately, 'elegant' carriages. Of course - like with beauty - elegance is in the eye of the beholder. 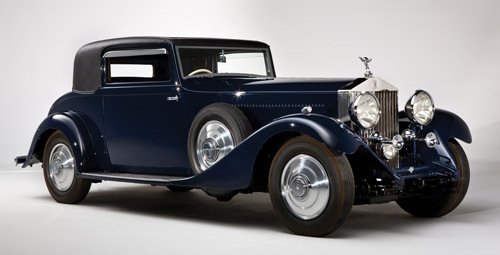 However, this Rolls-Royce Phantom II Continental (chassis 156MY) is called a "Sports Coupe" and looks quite elegant. 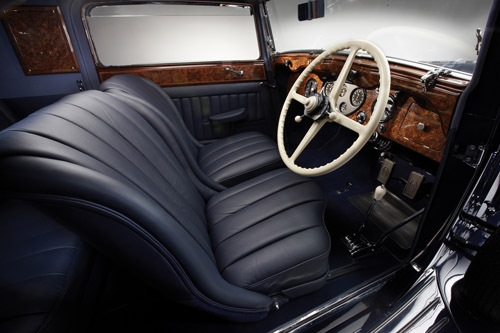 It is the only four place Sports Coupe of its kind built by Hooper & Co. There were similar looking Rolls-Royces, but most of them were four-door Saloons and not two-door Coupes. Click here to go to the gallery containing five slick studio shots. All images are sized 1600x1200, except for the engine shot. The images first open in 670 pixels wide. Click on a picture again to have it enlarged to 1600x1200 pixels. Image courtesy of RM Auctions.